Charles Eamer Kempe (29 June 1837 – 29 April 1907) was a Victorian designer and manufacturer of stained glass. His studios produced over 4,000 windows and also designs for altars and altar frontals, furniture and furnishings, lichgates and memorials that helped to define a later nineteenth-century Anglican style. The list of English cathedrals containing examples of his work includes: Chester, Gloucester, Hereford, Lichfield, Wells, Winchester and York. Kempe's networks of patrons and influence stretched from the Royal Family and the Church of England hierarchy to the literary and artistic beau monde. Charles Kempe was born at Ovingdean Hall, near Brighton, East Sussex in 1837. He was the youngest son of Nathaniel Kemp, a cousin of Thomas Read Kemp, a politician and property developer responsible for the Kemptown area of Brighton[note 1] and the maternal grandson of Sir John Eamer, who served as Lord Mayor of London in 1801. After attending Twyford School and Rugby, he attended Pembroke College, Oxford where he was influenced by the Anglo-Catholic Tractarian revival and considered a vocation to the priesthood. It was at Oxford that Kempe was inspired by seeing William Morris design the Debating Chamber at the Oxford Union. When it became clear that his severe stammer would be an impediment to preaching Kempe decided that "if I was not permitted to minister in the Sanctuary I would use my talents to adorn it", and subsequently went to study architecture with the firm of a leading ecclesiastical architect George Frederick Bodley. His first task, on leaving Oxford, was to gain some work experience. With the help of his well-connected father, Kempe was able to persuade Bodley to take him on as an assistant, and thus he found himself in Cambridge just at the time when Bodley was beginning the building and decoration of All Saints, Jesus Lane, Cambridge. Here he was able to learn from both Bodley and Morris and to develop his sense of how to colour a church. With Morris and Bodley, Kempe learned the aesthetic principles of medieval church art, particularly stained glass. During the 1860s Kempe collaborated with Bodley on the internal painting of two churches, All Saints, Jesus Lane in Cambridge and St John’s, Tuebrook in Liverpool. Later, in 1892, Bodley and Kempe would work together once more on All Saints at Danehill, East Sussex. In 1866 he opened a studio of his own in London, supplying and creating stained glass and furnishings and vestments. The firm prospered and by 1899 he had over fifty employees. As a trademark, the firm used a golden garb or wheatsheaf, taken from Kempe's own coat of arms. The mid-Victorian period were important years in the history of the design of English churches and Kempe’s influence is found in numerous examples, many in his home county of Sussex which has 116 examples of his work. The works at St Mark’s, Staplefield near Horsham, West Sussex dating from 1869 are regarded as especially important, representing the earliest of three known examples of Kempe’s wall painting. They contain key elements of Kempe’s figurative work. The angels holding the scroll are magnificently apparelled and the borders of their cloaks are embellished with pearls, each individually highlighted although they do not contain a design of peacock feathers, a well used embellishment in later works. Rosalie Glynn Grylls, Lady Mander, whose home Wightwick Manor, near Wolverhampton, contains many pieces of Kempe's stained glass, wrote in 1973: "Kempe's work has a unique charm; its colours shine out from jewels that cluster on the mitres or the crowns his figures wear and from their peacocks' feathers, while angels playing their instruments are drawn with tender delicacy and scattered above the main windows informally but making a pattern of precision. Above all, the prevailing yellow wash is literally translucent, for it lets through the rays of the full or the setting sun..."  Kempe's stained glass remained much in demand in England until the turn of the 20th century; his memorial windows at St Martin's Church, Newton Park (1879), near Leeds, are fine examples of his later work. On Kempe’s death in 1907 in accordance with his will the firm was reformed as C. E Kempe & Co. Ltd and Kempe's distant cousin, Walter Earnest Tower (1873–1955), was appointed Chairman. Tower thenceforth used a black tower above the golden garb. A lack of orders caused by the Great Depression ended the firm's life in 1934. Kempe was a rather shy person, who never married. He continued to live in Sussex most of his life and in 1875 he bought and renovated an Elizabethan house at Lindfield, near Haywards Heath in West Sussex. Kempe would entertain his clients and professional colleagues from his home enjoying the role of a country squire. Kempe died suddenly on 28 April 1907 aged 69, at 28 Nottingham Place, London, refusing to get medical help after catching a cold that led to congestion of the lung. He is buried in the churchyard at St Wulfran's Church, Ovingdean. Unfortunately, most of Kempe's records were disposed of after the firm shut in 1934. Charles Eamer Kempe remains a widely studied designer and artist. Author Adrian Barlow produced two books in 2018 and 2019 which discuss Kempe's life and the artists that surrounded him: Kempe: The Life, Art and Legacy of Charles Eamer Kempe published by The Lutterworth Press in August 2018 and Espying Heaven: The Stained Glass of Charles Eamer Kempe and his Artists in January 2019. Holy Trinity, Cuckfield; besides several windows, the painting on the ceiling and the pulpit are also his work. ^ a b c Barlow, Adrian (June 2010). "Kempe in Sussex". South Down Living. ^ Barlow, A. (30 August 2018). "Kempe: The Life, Art and Legacy of Charles Eamer Kempe". Lutterworth Press. Retrieved 6 March 2019. ...his (Kempe's) networks of patrons and influence, which stretched from the Royal Family and the Church of England hierarchy to the literary and artistic beau monde. ^ Betham, rev William (1 January 1801). "The baronetage of England, or, The history of the English baronets, and such baronets of Scotland, as are of English families" – via Google Books. ^ Collins, Philip N.H., ed. (2000). The Corpus of Kempe Stained Glass. The Kempe Trust. ^ "Information on Kempe wall paintings at St Mark's, Staplefield". South Downs Living. Archived from the original on 18 July 2012. ^ Historic England. "St Martin's Church, St Martin's View, Potternewton (1256154)". National Heritage List for England. Retrieved 6 March 2019. "STAINED GLASS: windows include a war memorial by Kempe firm in North aisle, South aisle Lady Chapel window in memory of Mary Cadman, died 20 March 1894. The unfinished West end had a small wooden bellcote when the church was consecrated..."
^ Dale, Antony (1989). Brighton Churches. London EC4: Routledge. p. 207. ISBN 0-415-00863-8. ^ Saunders, M. (July 2008). "Appreciating Victorian and Arts and Crafts Stained Glass: A Battle Half Won". Ecclesiology Today. 40: 88. ^ Pevsner, Nikolaus (2002). Yorkshire, the North Riding. New Haven: Yale University Press. p. 119. ISBN 0-300-09665-8. ^ Parish Church of Holy Trinity Cuckfield (PDF). 2005. Retrieved 16 June 2017. ^ "Kempe Windows". St Mary Magdalene Church, Hucknall. Retrieved 30 December 2018. ^ a b Hartwell, Clare; Hyde, Matthew; Hubbard, Edward; Pevsner, Nikolaus (2011) . The Buildings of England: Cheshire. Yale University Press. ISBN 9780300170436. 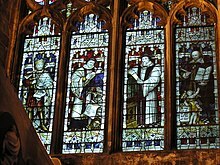 ^ "Photo Gallery - Stained glass windows by Kempe". ^ Historic England. "Church of St Alban, Tattenhall (Grade II*) (1230254)". National Heritage List for England. Retrieved 22 March 2019. ^ Jeffery, Robert (2007). Discovering Tong : its history, myths and curiosities. Tong, Shifnal, Shropshire: Robert Jeffery. p. 85. ISBN 978-0-9555089-0-5. Wikimedia Commons has media related to Charles Eamer Kempe.